Oil’s hitting 12-year lows as we speak – and that’s crushing a favorite vehicle of many income investors. If you’re not yet out, get out. Reason being, it could easily get even worse for the goo. In fact, it probably will. A surge in either the U.S. Dollar or a depreciation of the Chinese yuan of just 15% could send crude in the $20 range. So could a continued liquidation of massive hedge fund bullish bets – they’re still long nearly 50,000 futures contracts. Yikes. In 2015 alone the Alerian MLP Index lost 31%. Oppenheimer’s senior oil and gas analyst Fadel Gheit suggested that half of U.S. shale producers could go bankrupt over the next few years until crude finds its footing. On December 16 I said oil was going below $30 – and I warned you to sell four heavyweight energy traps immediately. I hope you listened, because they’re down an average of 15.5% in just one month with Marathon Oil (MRO) leading the way down the toilet with a 38% loss. Like big oil, the MLP space is a veritable killing zone for investors who got sucked – perhaps suckered – into energy firms trying to profit from the oil boom in the Midwest. Of course Master Limited Partnerships, or MLPs, aren’t your typical taxable investment. They act as pass through structures that avoid double taxation. Instead of dividends, they have distributions that are treated as a return of capital. Of course that’s when things are going smoothly – when there are profits to distribute. The last few years have seen profits run as dry as the oil supply was thought to be last decade. The Tortoise MLP Index saw 90% of its MLPs deliver negative returns in 2015. Of course the cure for low prices is low prices. As producers increasingly throw their hands in the air, supply will continue to come offline. Meanwhile, demand will soar as consumers enjoy cheap oil once again. But realistically, we could continue to see cheap oil for another 18 months or longer. One problem is many analysts expect the Saudis to fold and cut production. They’re wrong. OPEC nations – led largely by Saudi Arabia which accounted for almost a third of the monthly output in November – are actually producing more oil than they have in years. Saudi Arabia understands what a risk an oil producing United States is. They’ve correctly calculated that if they cut production to jack up prices, it only benefits U.S. producers who will steal market share. Output cuts means market share loss. The Saudis have made it clear that they are going to protect their market share – and they have the capacity to do so. At the end of December they made moves to cut many state sponsored benefits. They’ve increased domestic gas and kerosene prices, along with prices of state sponsored water, electricity and utilities. Saudi Arabia has aggressively cut costs to limit its budget deficit. This gives them the ability to hold onto market share at almost any price. 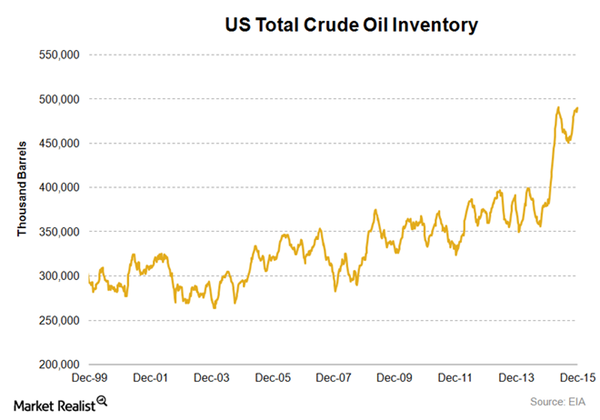 Meanwhile our domestic inventories of crude continue to grow. Even with the lifting of the export ban in December, we’ve got loads of crude. Our inventories are at all-time highs. Nationally, we’re still producing more than we ever have. This glut of increased inventories and record production should continue to depress prices. 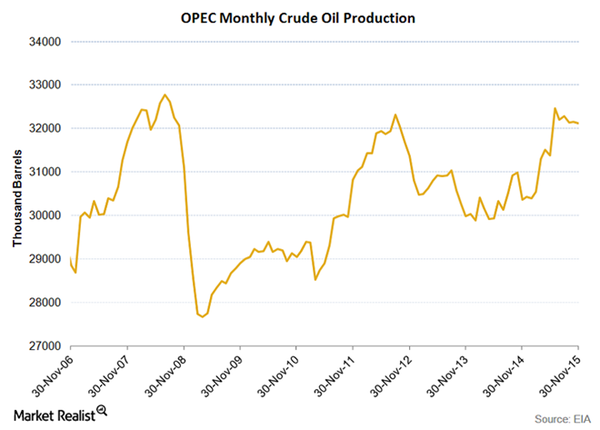 So if you think oil is going to turn around quickly, and that the Saudis will cut production, you’re fooling yourself. We’re looking at a runaway bear market in crude without a catalyst to break the pattern. All of the events that would normally predicate a bump in oil prices: General conflict in the middle east, OPEC infighting, Saudi Arabia and Iran escalation, and heck, even missile tests from Pyongyang haven’t even made a dent. The world’s largest oil consumers aren’t going to provide much help in the near term, either. Our consumption is flat lining while China consumption growth has slowed as it deals with a sluggish economy. The next two biggest consumers India and Japan both have unresolved structural issues that won’t be corrected soon. The fact is that the only thing that could meaningfully impact crude prices is strong U.S. economic growth. But even if our economy started significantly growing this minute, at best it’s a medium to longer-term impact to prices. There are simply no immediate catalysts for the energy sector. Which means we’re going to see a lot more pain in the MLP space. In September, I initially recommended that investors dump the dividend trap of big oil and that the price of crude was about to drop. The recent cut by Kinder Morgan (KMI), arguably one of the largest and more stable MLP holders out there, shows that no yields are safe. And KMI is likely just the first canary in the MLP mine. Here are some more MLPs and dividend traps that you need to avoid at all costs – or sell immediately if you own them today. Plains All American Pipeline LP (PAA) has fallen 63% off its high from the third quarter of 2014. 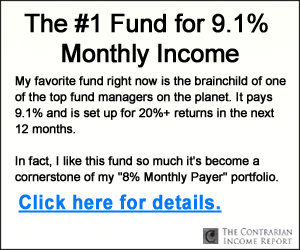 It announced this week that it would maintain its $2.80 dividend yielding 13.7%. How? By selling $1.5 billion in convertible preferred debt units to cover its financing needs. That may have calmed some investors that the dividend would be safe. But the company also disclosed that its financial projections were based on $35 per barrel oil that will increase to $60 by year end. I wouldn’t trust these projections – or the dividend. Williams Partners LP (WPZ) has a yield of 15.8% from its $3.40 dividend. The stock is down more than 65%. The company has a negative cash flow of $70 million. Williams Partners is also overleveraged, making it a ticking time bomb. The company holds nearly three times the industry average debt load. The company holds little cash per share, just $0.18, and has forward earnings of just $1.48 per share. 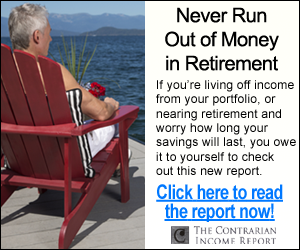 A $3.40 dividend looks unreasonable without additional funds. With their debt load it doesn’t look like it’ll come from the financiers. Energy Transfer Partners LP (ETP) is down 60% from last January. The stock has been pummeled like much of the sector. It still maintains a $4.22 dividend with a yield of 15.5%. The company also has a negative cash flow to the tune of $86 million. This MLP – like many others in the sector – also has little cash on hand, $1.71 per share, and has forward earnings of just $1.95 per share. How long can ETP, WPZ and PAA keep these dividend rates up in the face of declining quarterly earnings? Not long. Oil and gas are absolute necessities in every corner of the globe and the sector will certainly be ripe with buying opportunities once prices stabilize. Until that happens, I’m raking in much bigger – and safer – yields in another sector that’s capitalizing on the biggest demographic shift in U.S. history. You see, no matter what happens to the price of oil and gas, the outcome of year’s election, or even China or the Fed, there’s one sure economic bet in America: The country will be older in the future than it is now and demand for healthcare services is set to skyrocket. In fact, by 2024, national healthcare expenditures are expected to climb to $5.43 trillion, that’s about 20% of our GDP. This growth is fueled in large part by the Baby Boom generation. They make up 28% of the U.S. population and number 77 million strong. 10,000 of them turn 65 every single day and will continue to do so every day for the next 15 years. I’ve uncovered three particularly solid healthcare plays that are set to reap massive profits from this demographic shift. They pay yields of 6.5%, 7.5%, and 8.2%, and all three are increasing earnings and their dividends annually. Click here for the names of all three and discover exactly how we’re playing the biggest demographic shift in U.S. history.